The row between Northern Ireland and Kyle Lafferty has escalated, after the striker pulled out of Michael O’Neill’s squad for the games against Austria and Bosnia-Herzegovina, citing an Achilles problem. 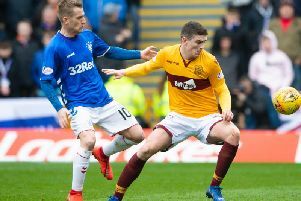 Irish FA chiefs are understood to have sent an email to Rangers, invoking a FIFA ruling allowing them to request that Lafferty misses Sunday’s clash with Hamilton. Rangers have been linked with Dundee midfielder Glenn Kamara - just 24 hours after former Ger Steven Davis was touted for a return to Ibrox. The Finnish international, who scored his first goal for his country earlier this week, has been a target for a number of clubs in Scotland and England. Celtic have been handed a boost ahead of their clash with Hibs, with defender Filip Benkovic likely to be fit to face Neil Lennon’s side. An Achilles complaint kept him out of four Celtic matches but he returned for the impressive 6-0 win at St Johnstone, and completed 90 minutes for Croatia Under-21s as thy beat Greece 2-0 last week. Tom Rogic is also expected to be included in Celtic’s squad to face Hibs, despite playing for Australia on Monday night. The midfielder has often sat out the first match back after an international break but reports suggest the Socceroos ace will report back to Lennoxtown as the Hoops prepare to host the Easter Road side. Former Hearts star Christian Nade has spoken candidly about his battle with depression, revealing the intervention from a friend that saved his life. Celtic winger James Forrest has backed Hearts and Hibs to sustain a genuine interest in the Premiership title race. The league resumes on Saturday, with Neil Lennon’s men at Parkhead and Forrest believes the fact that Brendan Rodgers’ title-winners find themselves behind the Edinburgh pair is proof of the greater challenge they face this season.